Kazakhstan in the autumn of 1940 was the last place were my mother wanted to be giving birth to me, her second child. 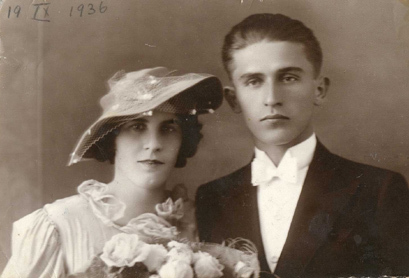 Before the war, my parents lived comfortably in a town called Tarnopol in Eastern Poland (now in the Ukraine) where they had moved from their native Sambor. Father had left the army and was working in the prison service while mother, a teacher by profession, was bringing up her two year old daughter Krysia in her dream ‘town centre flat with a balcony’. Then war broke out and all hell was let loose. My father, an officer of the reserve, rejoined his regiment while my mother and her eldest sister returned to the family home in Sambor where, supported by a network of family and friends, they had the best chance of surviving the war. After Stalin’s invasion of Poland, as arranged between Russia and Germany in the Ribbentrop-Molotov pact, Poland’s defence was no longer viable and the army was ordered to disband. Having avoided capture by the invading Russians my father returned home but immediately discovered that the NKVD (Soviet security forces - precursor to the more familiar KGB) were looking for officers and other ‘intelligencia’ so he went into hiding, constantly moving from house to house among friends and family, never staying more than a few days in any one place. My mother went back to work as a teacher to keep the family going. the NKVD in Katyn wood. He was one of 4,500 Polish officers and intelligencia who were murdered by our future ally the Soviet Union. A further 20,000 are still unaccounted for. 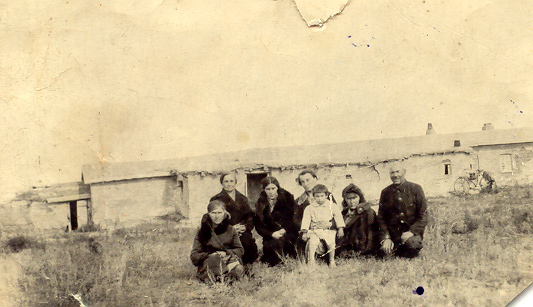 After a journey of two to three weeks (my mother lost track of the days) they were taken off the train, together with five other families, at Martuk in the district of Aktubinsk in Kazakhstan. From Martuk they walked seven kilometres to a small village (posiolek) called Nagorny. This was an agricultural ‘kolchoz’ – a state owned farm – where they were immediately set to work in the fields. Initially they were given a shepherd’s hut in which to live because in the summer the shepherd was out on the steppe with his flock. Later they were moved into a cottage at the edge of the village that belonged to a peasant who had been deported into internal exile elsewhere in Russia. The front door of the cottage opened onto a corridor with a room on either side and an attached stable. 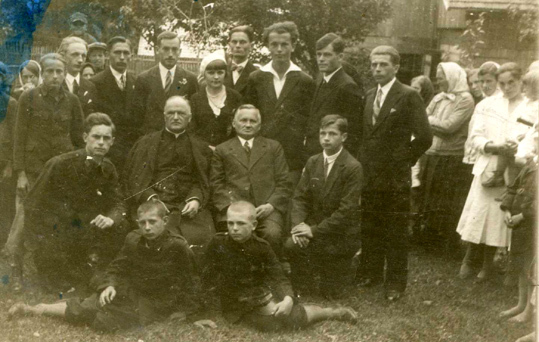 They shared the cottage with fellow Polish deportees Mrs. Smoleńska and her daughter, the Smoleńskas occupied one room while our family, four adults and two children, lived in the other. Everyone had to work in the kolchoz. Lenin’s nobly sounding motto, that had seduced so many English intellectuals, ‘To everyone according to their needs, from everyone according their abilities’ had been translated on the ground into a much more practical ‘nie rabotayet nie kushayet’ – don’t work, don’t eat – so those who reported for work received half a loaf of bread a day and the foreman would turn a blind eye to small amounts of produce that might be taken home at the end of the day. This food had to be shared with any member of the family who for some reason was unable to work. Each ‘Work Day’ was recorded and in the autumn everyone received farm produce for the winter according to the number of ‘Work Days’ they had put in. 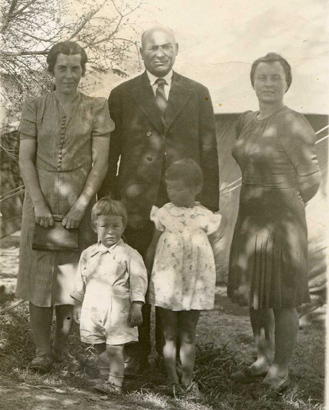 During the summer of 1940 our family had earned a sack of rye and a sack of potatoes. In October after I was born my mother was allocated 250gm. (10 oz.) of bread, half a litre of full cream milk and two litres of skimmed milk a day for the baby. Her own ration was of course still subject to the ‘don’t work, don’t eat’ rule. We survived that first winter thanks to a sack of flour that my grandfather had the foresight to take when they were arrested and two food parcels sent by my mother’s two sisters who were still in Poland (mainly flour, buckwheat and a little sugar). Money came from selling anything that was not strictly necessary for survival like my grandfather’s suit, the sugar and other little luxuries that came in the food parcels. The Kazakh villagers were indifferent to us but there were two or three Russian families without whose help we could not have survived. We don’t know why they were there. It is likely that they had been sentenced to internal exile just like we were but it was best not to ask questions. They helped in many small ways. We were not allowed to buy anything at the village shop so they bought things for us. On one occasion my aunt went to Martuk to sell grandfather’s suit, because there it would fetch a better price, and found herself in serious trouble because we weren’t allowed to leave the village without permission so, in future, they would take things to Martuk that we needed to sell. Their greatest contribution was made right at the beginning when they introduced us to ‘kiziak’. Kiziak was, possibly still is, made by collecting dried animal dung on the steppe, soaking it in water then mixing it with straw and forming into briquettes which were then dried in the sun. This was to be our fuel for the winter and, throughout the summer, any time not working for the kolhoz was spent collecting dung and making kiziak. Without it the whole family would have frozen to death in the -30°C temperatures of a Kazakh winter. Hope came with Germany’s invasion of Russia in June 1941. Suddenly and unexpectedly we became Russia’s allies. A Polish army under the command of Gen. Anders was being formed in Russia and an amnesty was declared for all Poles in prisons and internal exile. We were now free to buy in the village shop and travel to Martuk. My uncle was released from prisoner of war camp to join the Polish army and he managed to come and see us in Nagorny just before the snows fell. 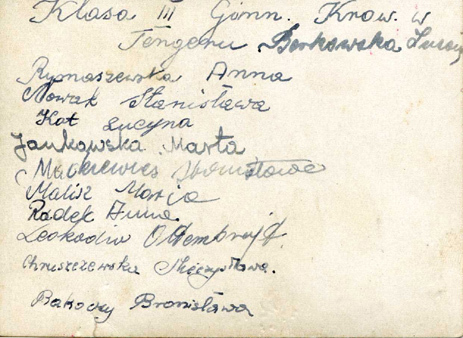 He helped with making ‘kiziak’, brought money and, most importantly, papers to join the army as his family. Wisely, it was decided not to travel that winter. The army was living under canvas and the Russian authorities were providing rations only for soldiers so many of those who travelled that winter perished from cold, hunger and exhaustion. We finally left Nagorny in April 1942 and joined the Polish army in Kitabo in Uzbekistan. By the time we arrived my uncle had been moved to another army centre but none the less we were welcomed, looked after and, for the first time since the outbreak of war, felt relatively safe. Life was still hard. We lived under canvas and the Russian authorities were providing meagre rations but only for soldiers so these had to be shared with the civilian families. A few days before we left Kitabo, my grandmother died. She had contracted an ear infection while still in Nagorny, untreated, it became septic and was operated on by an army surgeon when we arrived in Kitabo. It seemed to be clearing up but the surgeon warned that with the organism in such a weakened state it may not be able to fight off the infection. 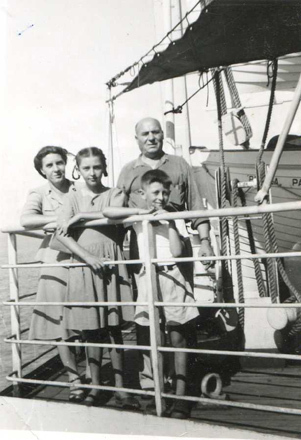 We left Kitabo to travel to Krasnovodsk on the Caspian sea from where we sailed with the army to Pahlavi in Persia. Persia was very welcoming. By the sea in Pahlavi, where we disembarked, a tented city had been set up. This was a transit area where we were registered, given papers, issued with clothes and allocated to one of three camps on the outskirts of Teheran. Camp II, like the other camps, was under canvas but well supplied, food was plentiful, schools and field hospitals had been set up. Troops were being re-equipped, trained and made ready for duty. Civilians began the long process of adjusting to a normality in which there was adequate food and even time to attend to their social and cultural needs. My mother particularly recalled a visit to the Shah’s palace gardens and walking through the shopping streets of Teheran, although there was still no money for any serious shopping of course. There was still the reality of war. 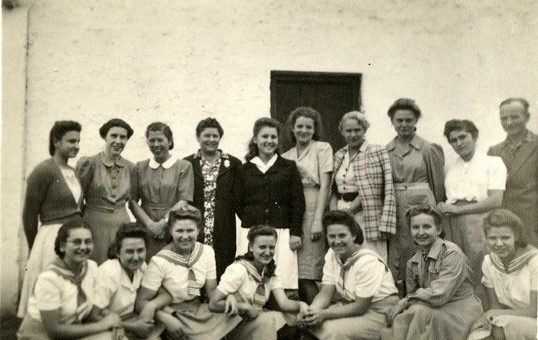 All the young and able bodied were expected to join in the war effort and my aunt joined the Women’s Auxiliary Service. This was a particular wrench because it was she who had been the main provider for our family. She was the one who bartered, traded and stole the food that made the difference between perishing and surviving. Unable to have children herself she made it her purpose that my sister and I survived where so many children did not. She insisted that, even after I started eating solid food, I continued to be breast fed until we left Russia and saw to it that my mother had the lion’s share of any nutritious food that she had ‘organised’. Inevitably, given such a concentration of people and rudimentary sanitary facilities, an epidemic of dysentery broke out. Despite the best efforts of the medical staff this lead to a horrendous mortality rate, particularly among children, whose undernourished and weakened metabolisms succumbed within a day or two. When I contracted the disease my mother refused to let me be taken to the field hospital, where she had seen children dying by the dozen, and insisted on nursing me herself. She clearly understood the importance of hygiene and hydration and gave me lots of water, but only after it had been boiled, and melons which were plentiful in the camp. I survived the dysentery but it took its toll on the organism and soon afterwards my legs began to bow and I stopped walking. Rickets or ‘the English disease’, as it was known in Poland, was diagnosed. Once again home remedies were applied, cod liver oil and lots of sun, the bones strengthened once again and the only visible sign left is a ridge across my teeth where development had been temporarily impaired. 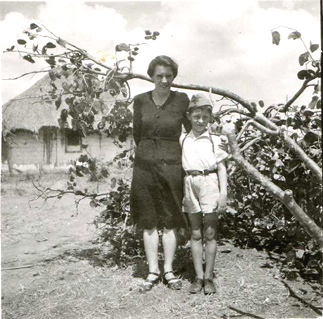 By the autumn of 1943 my mother felt sufficiently confident to leave my sister and me in my grandfather’s care during the day so in December 1943 she began working professionally as a teacher at the camp school. Once the army had moved out to their operational positions in the Middle East it was time to consider the civilians who had been left behind. The tented camps on the outskirts of Teheran were clearly not viable as a long term solution and the authorities decided to set up Displaced Persons camps in India and Africa. As a teacher my mother was able to choose where we went and she chose Africa. In the spring of 1944 we travelled by army truck down to Karachi and then by ship to Africa (she didn’t say which port) then by train to a camp called Bwana M’Kubwa in what was then Northern Rhodesia. We stayed in Bwana M’Kubwa for just four months before she was posted to Lusaka, also in Northern Rhodesia now Zambia. 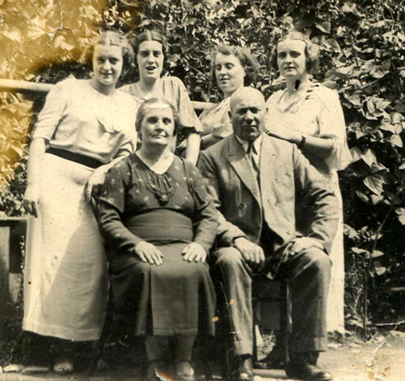 My mother, Grandfather, aunt - Marysia Łotecka, me and my sister Krysia in Teheran 1943. My first, very ordinary, childhood memories are from Lusaka: A dark eyed beauty called Jagódka sitting opposite me in the kindergarten sand pit; carrying the kindergarten totem pole in a school procession only to disgrace myself by falling over and stopping the entire procession; starting school at five but in the seven year olds class because I was the only five year old in the camp, and then being threatened with extreme violence by my older classmates for having the best marks at the end of term; the wonder of electric lighting in the camp commandant’s hut. 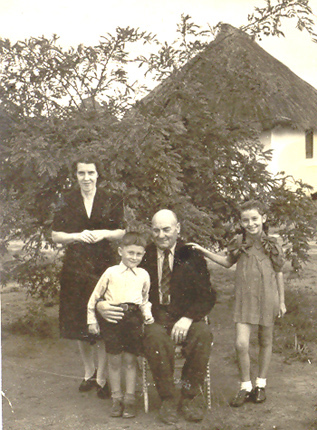 Right;-My mother, grandfather Józef Tuczek ,my sister and me by our hut in Lusaka. By 1947 the camps were being actively liquidated. First a commission from the Polish communist regime set up by Stalin arrived to persuade us to return to communist Poland. They received short shrift from people whose homes had been annexed by Russia and were no longer in Poland and who were still thanking God for delivering them from the Soviet communist paradise. The Americans came next followed by the Canadians, Australians and New Zealanders to take their pick of the humanity on offer. In that particular market my mother; young, intelligent, educated with two young children who would grow up to be fine citizens of their country, was inundated with offers, but there was a catch. My grandfather was old and might become a burden on the host country so the offers were always in these terms; you and the children can come straight away and in a couple of years time you will have settled in and earned enough to bring your father across from wherever he might be at the time. To my mother’s eternal credit she turned these offers down flat. 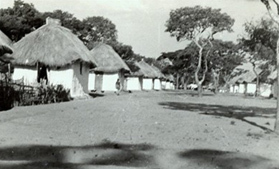 We were the last to leave Lusaka at the beginning of 1949. By this time my mother was headmistress of the school and responsible for closing it down. She couldn’t bear to burn all the books so we acquired our first proper possessions - a tea chest full of books. 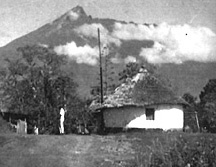 She was posted to a camp called Tengeru near Arusha in what is now Tanzania. Tengeru was dominated by a splendid view of Mt. Meru but, unlike Lusaka which was quite close to town, so we could regularly go into town for shopping, it appeared to be in the middle of nowhere and, to a child, the occasional journey by truck into Arusha seemed to take for ever. Tengeru camp with Mt. Meru. The posh square huts with a concrete floor and windows. On arrival in Tengeru we were allocated a pair of mud huts; round, dark and tiny with mud floors, just like the native’s huts. These huts were quite exciting for us kids but mother didn’t seem to share our enthusiasm and she must have had some leverage because we soon moved to one of the large posh square huts with a concrete floor and windows with fine wire mesh mosquito nets and a separate outside kitchen. I can’t remember if there was any electricity in the camp, I have a feeling that even the camp commandant used paraffin lamps for lighting, primus stoves for minor cooking and, if you were in a posh square hut, you had a separate outside kitchen with a wood burning range for cooking. Tengeru was much bigger than Lusaka, it had a primary school and two secondary schools, one for the academically inclined and another that taught vocational subjects. There was also a large boarding house for children and young people that had been either orphaned or separated from their parents. There was considerable agricultural activity. Apart from the gardens that were springing up around people’s huts there were large fields of maize, potatoes and other vegetables like carrots and cabbage. I don’t know if these were grown under the auspices of the camp or some local farmer but a lot of the people in the camp were employed in this farming activity. Pressure was now building to close the camps so UNRA, (United Nations Refugee Agency) which was responsible for the camps, arranged another round of visits by the various immigration commissions which went through their selection procedures once again and took further significant numbers. By early 1950 only those that had been positively rejected by the three commissions or who, like my mother, would not accept the terms that were offered were left in the camp. That’s when the British commission arrived. 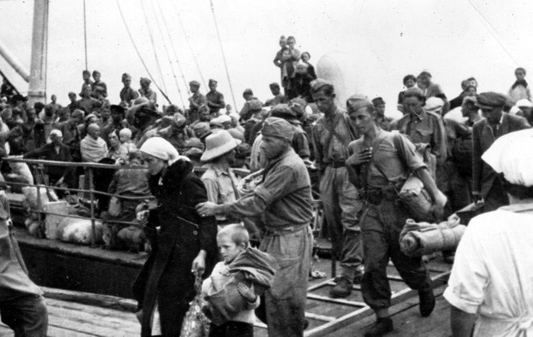 It was different because I think they knew that leaving people in the middle of Africa wasn’t an option and their main concern was to know if anyone had health problems, particularly infectious diseases like TB, and needed either treatment before sailing or special provision on arrival in England. In July we travelled by rail from Arusha to Mombassa and then sailed on the Dundalk Bay to England, arriving in Hull on 2nd September 1950. After a few days in a transit camp near Hull we travelled in a fleet of coaches to Springhill Lodges camp in the beautiful Cotswold countryside. For more information on life in a U.K. displaced persons camp you can visit www.northwickparkpolishdpcamp.co.uk but essentially, normality set in. Until we came to England I had never been in a house with stairs or met a child of my own age. My friends and school mates were all either two years older or two years younger than me so, for the first time in my life, I went to school with and had friends of my own age.